This is not a story about a bunch of heroes fighting the elements. The ocean has storms for us beyond imagination. Don’t even think about trying to fight this. If you see the wind as your enemy, you have no chance. You can’t win, and you can’t hide. 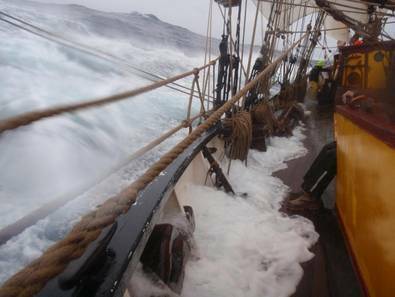 Once we would leave the coast, we knew there would be no way back against the strong winds from the west. Once you are out there, you are there. You have to love it, that is the only way. 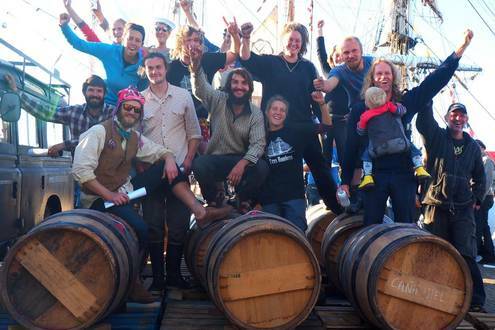 That’s how the Windvinder is doing it. He learned it from the birds. Look at that seagull sitting on the waves and taking off in a storm without any flapping of the wings, just stretching out the wings in the right angle of attack. That’s the way to do it. Play with it. Soaring weightless over the waves, close to the constantly changing surface of the sea, wing tips just not touching the waves. Green valleys, thundering white breakers. Enjoy the light, the speed, and the power everywhere around. Let the wind take you high up in the sky, without moving a muscle, and watch the living landscape of waves from above: that’s where we are going. There is no hold nowhere and that is wonderful. 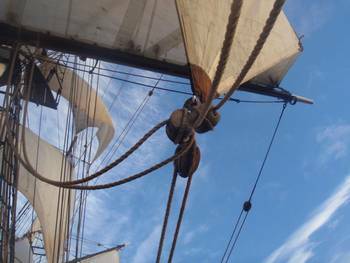 As wind- and wayfinder with a great love for celestial and emergency navigation, I was prepared to find the way to the English Channel if necessary without any instruments, also without sextant. 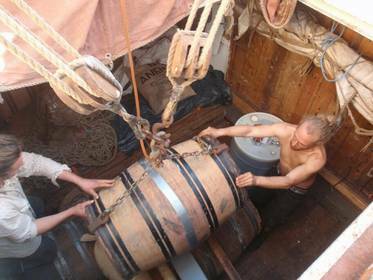 But all went well, the seawater stayed (mostly) where it belongs, chart room and navigation equipment survived dry and without damage. 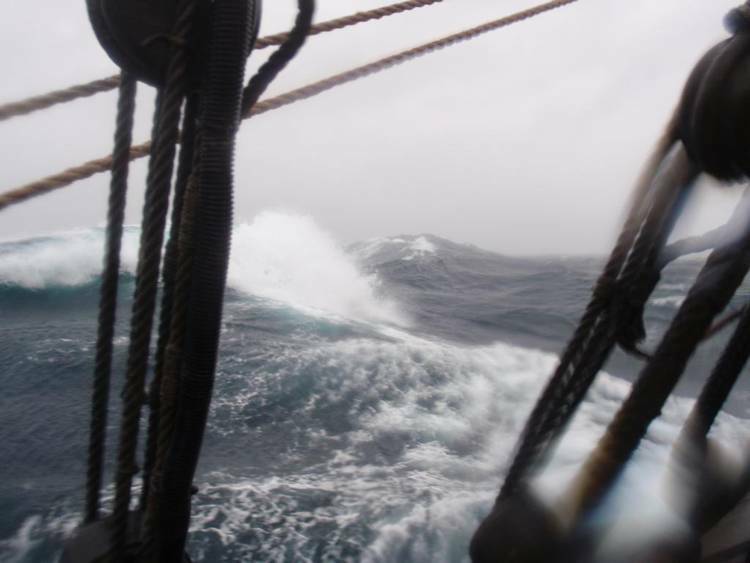 Even so, the voyage was challenging enough… Quite a wet and windy trip, surfing downwind from one low to the next, and counting the days that separated us from hurricanes Matthew and Nicole... (which was difficult to estimate, since they were constantly changing course and speed). What we knew was that we didn’t have much time between one storm and the next. How much, we didn’t know. We had almost 3000 miles to sail. 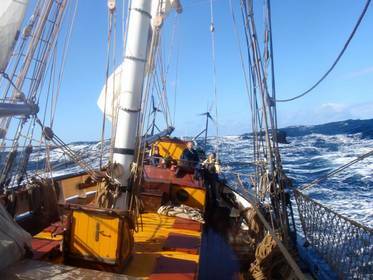 Karl brought us finest northerly and later westerly winds for the first days - and yet sheltered water, in the lee of Nova Scotia and Newfoundland. 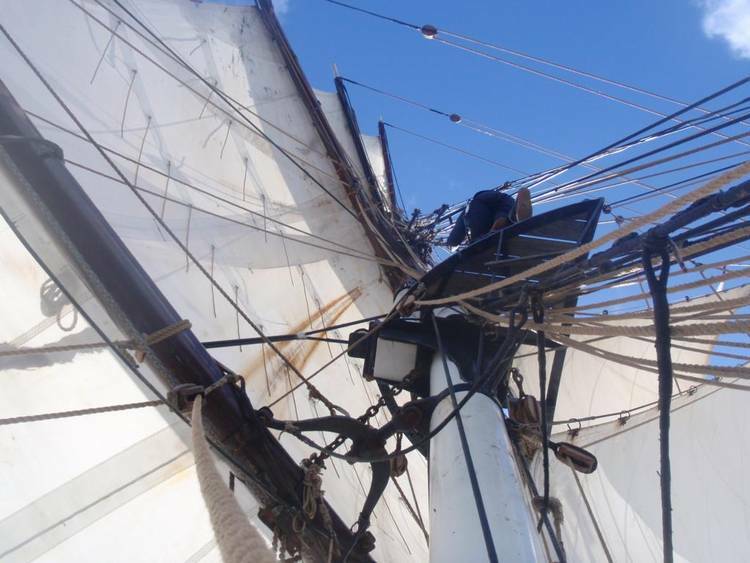 He still had more than 60 knots of wind in his center when he was east of us - but where we were, it was just perfect sailing wind, cold and sunny weather with an incredibly clear sky, and a great and deep blue sea in front of us. What would be the fastest way to the English Channel ? The great circle was the shortest route in miles, but would have brought us far to the north. 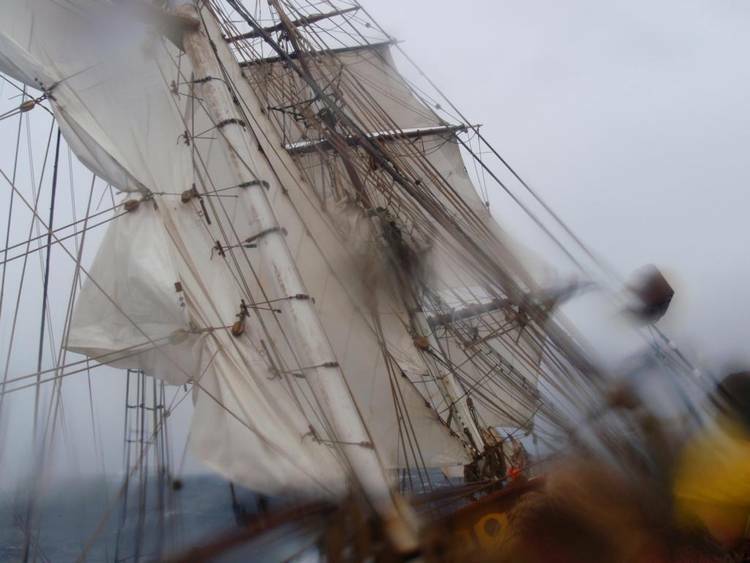 For a sailing ship the fastest route is where the best winds blow – in our case, the south side of the lows that were moving from west to east across the ocean. 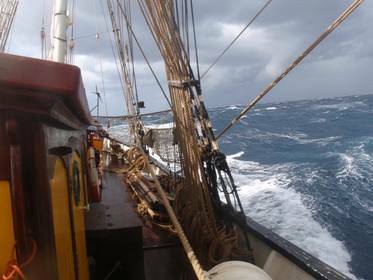 So we sailed on a flexible route - racing from one low to the next: chasing the westerlies… gale-force wind whenever possible. What we needed was speed, not nice weather. 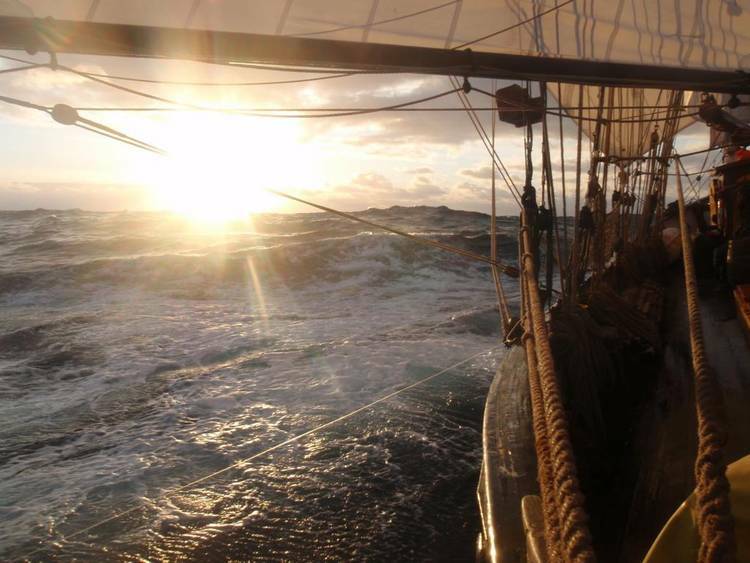 The worst thing that could have happened to us would have been to be caught in a calm, no wind at all, with a hurricane approaching and no chance to get away. 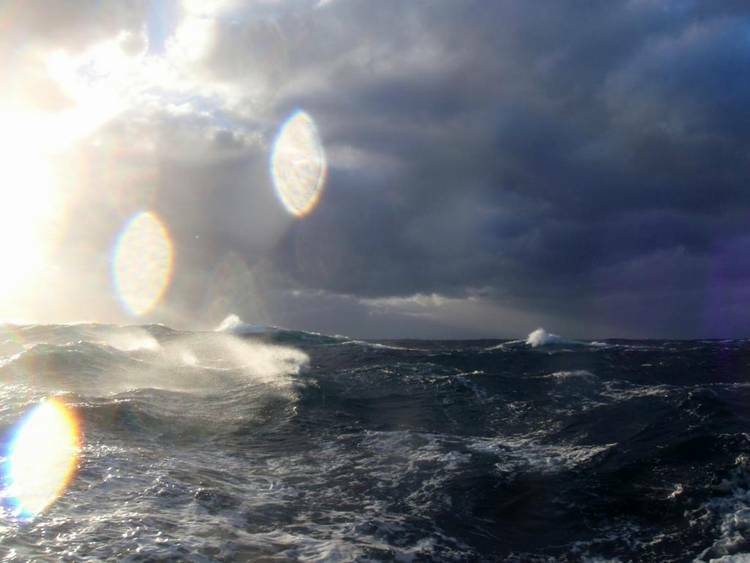 Our friend Karl disappeared quickly – moving northeast with 43 knots, heading for Iceland. But the next lows were already approaching from behind us, one after the other, some a bit more in the north, some more in the south. To catch the westerlies, all we had to do was to be in the right place at the right time: south of the lows and north of the highs, on the meandering highway to the east. We adjusted our course to the daily weather forecasts that we received as grib files via SSB and Pactor: knowing where the lows would go in the next days, we knew where we had to be. 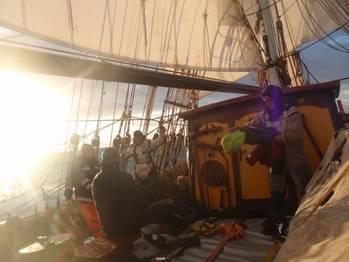 After Karl disappeared, sailing southeast for two days brought us to an area with wonderful warm southwesterly and later westerly winds, where we were flying over the water with more than 13 knots. 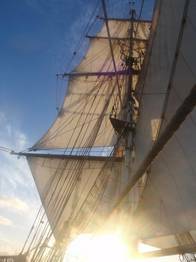 Had we sailed straight east, or followed the even more northerly great circle route, we would be sitting in headwind on the Grand Banks now. Around this time, the National Hurricane Center issued the first advisory about a new storm forming in the Caribbean Sea, later called Matthew. 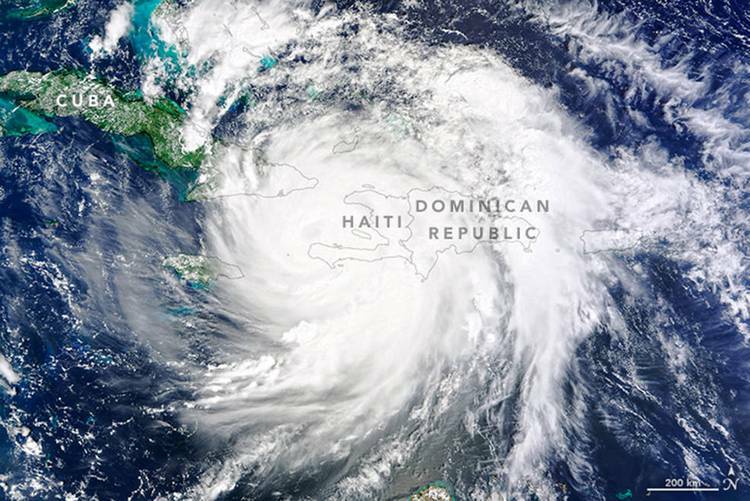 He was to become the strongest and longest-lived Atlantic hurricane of the past decade. 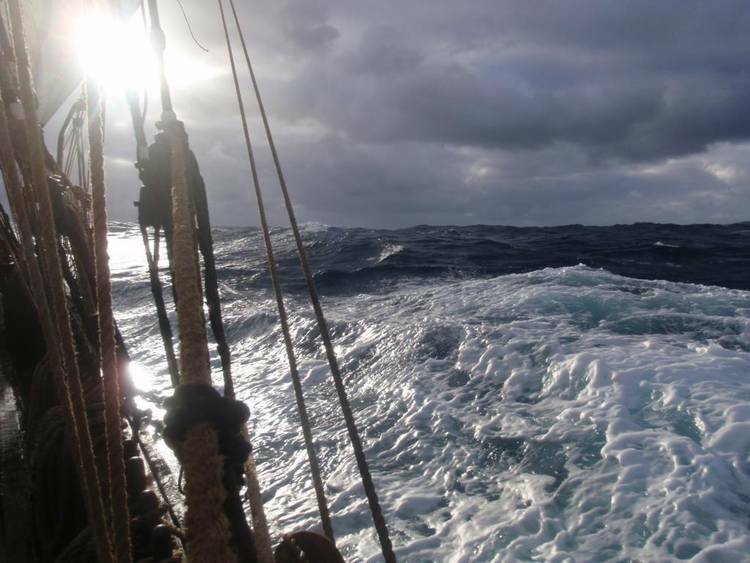 Heading east again, with top speed in gale-force winds and rough but following seas, we crossed Karl’s path five days after he had been there, about half way between Newfoundland and the Azores. 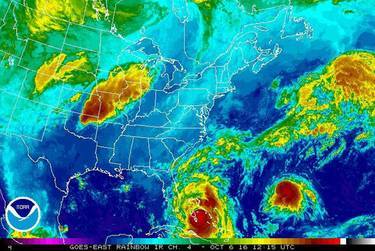 At that time, Matthew had turned from a tropical storm into a Category 5 hurricane in just 36 hours, with 140 knots of sustained winds and gusts of 170. He was now south of Haiti, moving nerve-wrackingly slowly westward, but about to turn north anytime soon. Still far away… but we had seen with Karl how fast they can pick up speed. It was like flying. There was no horizon. Beyond our light-giving bow wave and the navigation lights it was darkness all around, and the deck was perfect darkness too, with the warm red compass light like a single open eye watching the sky. The darkness was intense and beautiful. Not close and not far, it was just there. 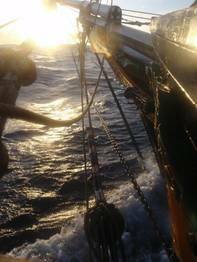 Phosphorescent waves washing rivers of stars over the deck showed silhouettes of galley and cargo hatch; that was our deck light. 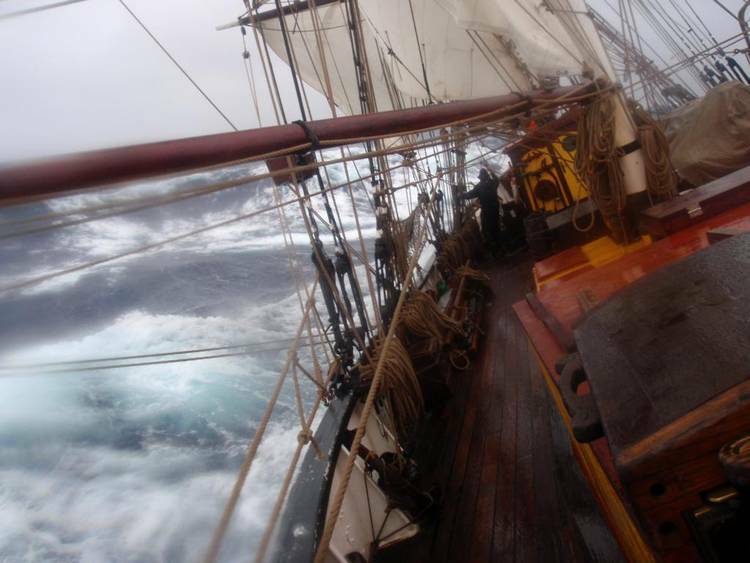 The less we could see, the more we would hear: the wind in the rigging, the breaking seas and the storm birds around us. 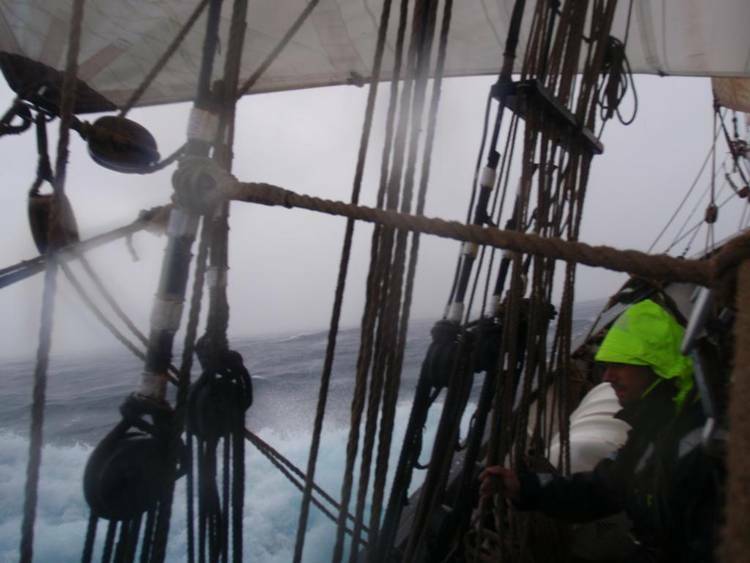 Mostly the squalls gave us more than enough work with the sails to stay warm, but when there was nothing to do except for steering, we were quite frozen at the end of the night. We reached the longitude of the Azores, a few hundred miles north of the islands, on October 4, the day that Matthew killed 900 people on Haiti. While Matthew was heading for Bahamas and Florida, a new tropical storm formed just east of him, called Nicole. 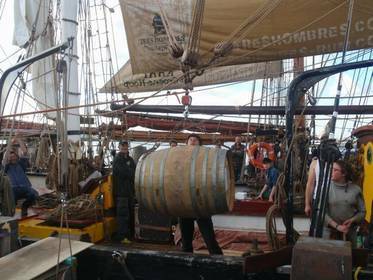 We took no time for the Azores, and went on with northeasterly course, with reefed sails in dark gray days and pitch-black starless nights, 8 Bft from the south. 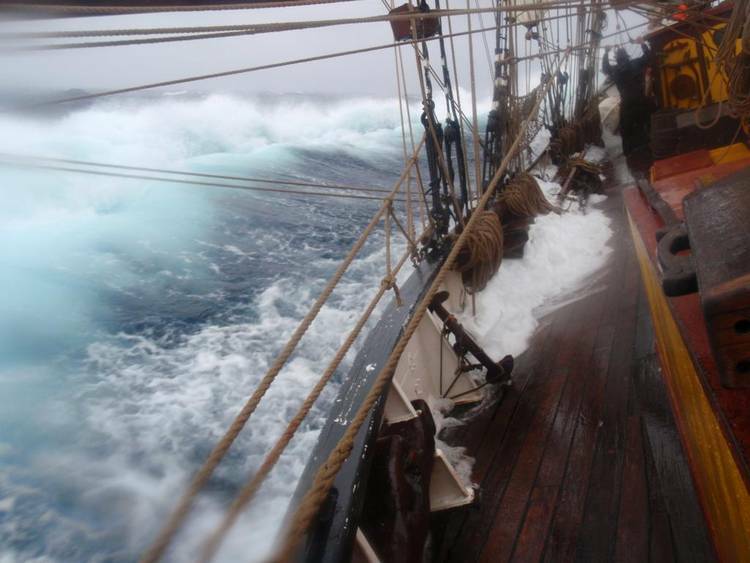 Rough seas and crazy amounts of water washing over the deck. But still nothing broke, except for some coffee mugs. Cooking became quite an adventure, everything flying around in the galley. But we even managed to bake fresh bread every night! We were about two thirds of our way from Canada to Europe when we met a snow white Snowy Owl, who looked at us in amazement, and we at him, while he continued his solitary flight to the west - straight against the wind - without a sign of fatigue. Matthew skimmed the coast of Florida and the Carolinas, and then turned northeastward to the open sea – but exhausted by his landfalls, he gave up before he came close to us. Meanwhile, Nicole had developed into another major hurricane - and she was really a beast, driving everybody crazy with sudden course changes, sometimes by 180 degrees. 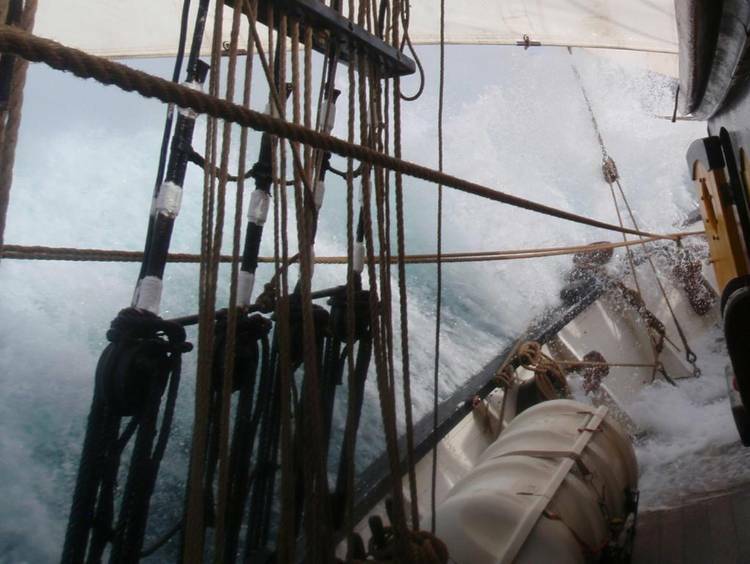 We were tacking at the entrance of the English Channel, when Nicole swept over Bermuda with 105 knots wind. Then she turned northeast with increasing speed... obviously not afraid of cold water. 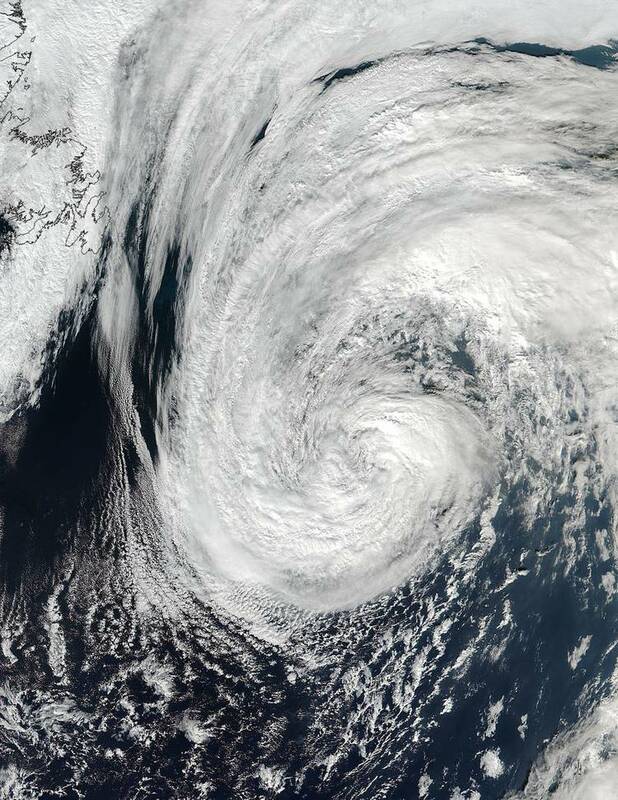 Satellite image showing Nicole on Oct 17 over the North Atlantic, the day she reached our latitude. On the left, Newfoundland. 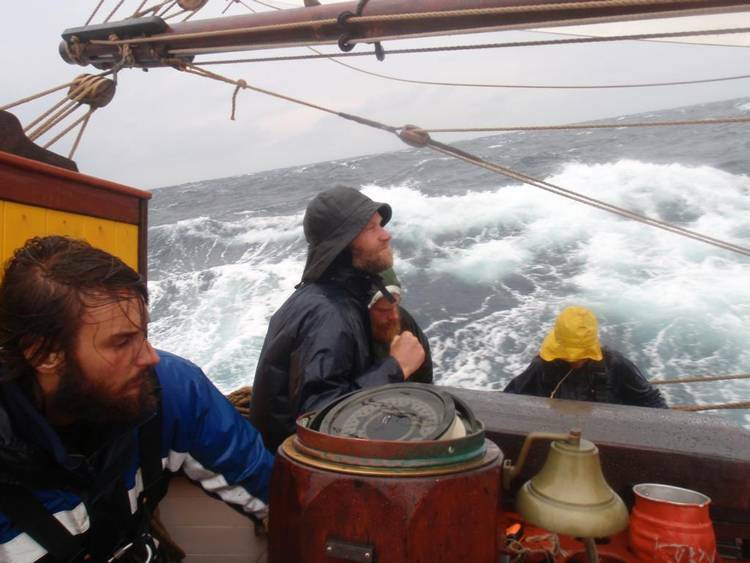 It was a wet, but wonderful and inspiring voyage. 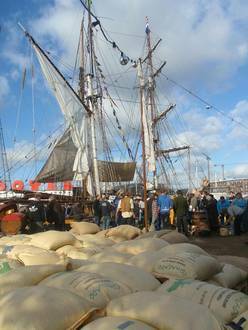 Hard work, but on the most fantastic cargo ship I’ve ever seen… culminating in a great unloading- and welcome home party at NDSM in Amsterdam – the birth place of the first Windvinder. And I have my hands free again for Thor and Project Windvinder! If you want to sail with us the coming years, and help develop the next generation of purely headwind powered oceangoing vessels, welcome on board! Please send an email. Info about the Next-Generation Windfinder voyage here.